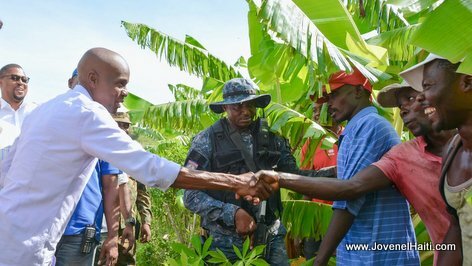 Look at this photo... Haiti President Jovenel Moise shaking the hands of some Haitian farmers during a Caravanne Changement visit to the countryside. President Jovenel Moise says: "Our farmers have a great deal of importance in Haiti's development. I continue to work tirelessly to guarantee them all the full support of the state." Alo Prezidan Jovenel Moise, kisa w gen nan djakout ou pou vil Hinche? President Jovenel Moise: Haiti is at the crossroads, we need 6,000 kilometers of roads, there's only one way to get it done!